Intro to Electronics is back! If you have been checking the blog and our calendar for the past few months, wondering when the Intro to Electronics workshop will be offered again, now is your chance to sign up! The workshop will be on Saturday, November 9, from 2 PM until 4:30 PM. Weather you’ve had a project in mind for awhile or are looking to learn something new, we’ll help you take those first steps towards making your great ideas work. The workshop is designed for complete beginners but it is also a good refresher for those who haven’t done electronics in awhile. 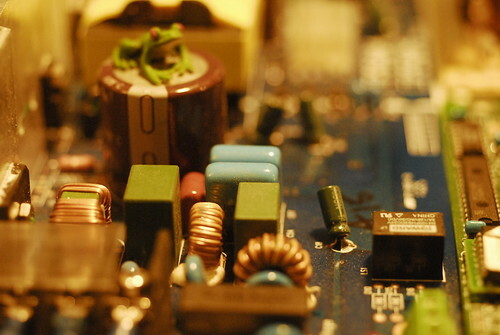 We will go over some fundamental electronics components, such as resistors, diodes, capacitors, switches, potentiometers, and simple integrated circuit chips. Through a series of hands-on circuit building exercises we will cover proper wiring, reading circuit diagrams, voltage, and current. The $50 workshop rate covers all the materials and two and a half hours of instruction. To sign up, give us a call (206 357 9406) or come down to our space on Broadway.